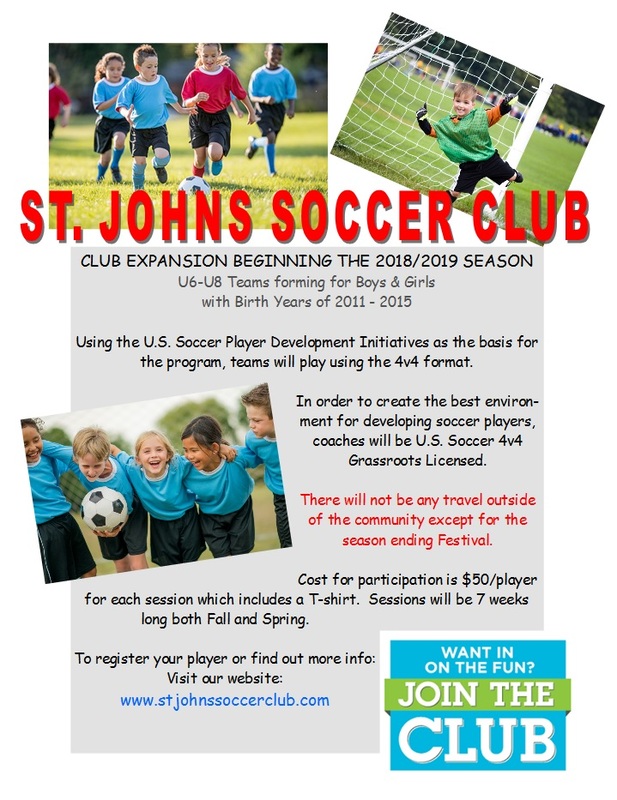 ACADEMY GROUP (U5-U8) | St Johns Soccer Club Inc. This is a low cost, introduction to soccer program that is following the standard U.S. Youth Soccer Player Development model and will be coached by U.S. Soccer 4v4 Grass Roots Licensed coaches for 7 week sessions, both Fall and Spring. There will not be tryouts per say for the U6-U8 group, but there will be a meet and greet on Monday, June 18th for them to meet SJSC Staff and Coaches, plus a little time to do some drills and small sided games with the Coaches as an ice breaker and kick-off for their season. Staff and Coaches will be able to talk to parents and answer questions and help identify the schedule and planning going forward for the groups. U6-U8 players will practice 2 nights a week, typically 1.25 hrs each practice. Inter-club games will be played on the weekends, with all games played in St. Johns at our Townsend Road Complex. The final game weekend (Festival) will be held in the Lansing area, most likely East Lansing Soccer Complex (not yet confirmed), where our teams will compete against other community teams. Coaches are volunteers who will be U.S. Soccer Grass Roots Licensed and have valid Risk Management. All coaching will be under my direction of the SJSC President and follow the U.S. Youth Soccer Curriculum for the appropriate age groups. For the entire soccer season (1 year) the cost is $100.00. $50 for Fall and $50 for Spring. They will get 2 shirts throughout the year, one for each session. Shorts, socks (Black), shin guards, cleats (or tennis shoes) and a size 3 ball are required and not included. All of the equipment the U6-U8 teams will use for practice and games will be provided by SJSC and most of it is brand new (training bibs, cones and nets). Our focus is on player development and enjoyment of the game. The environment should be fun, enjoyable, and also challenging both technically and tactically. Building at each players pace and skill level, a desire for the sport of soccer while preparing them for the next step in developmental growth. At the same time, starting this age group off alongside our full line up of teams/players/age groups allows for a better understanding by parents as to the natural progression of skill development and the options that we, SJSC provide players as they transition through the sport of soccer.